Operates at 1000 psi and has a minimum operating speed of 1500 RPM. 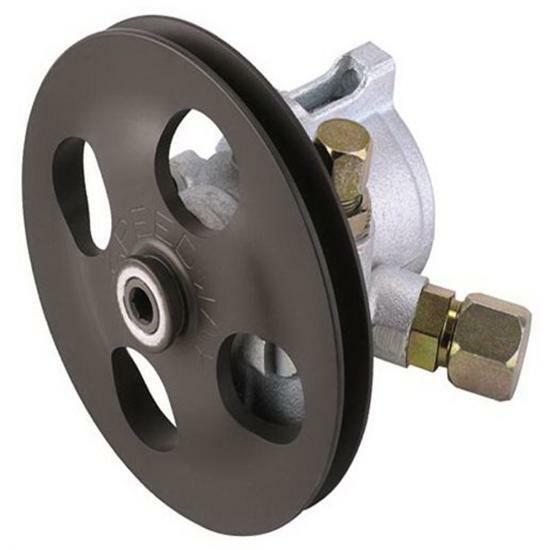 Cast iron power steering pump has aluminum V-belt pulley. These pulleys are popular for use on late models and IMCA modifieds. Comes with AN6 pressure fitting. Order AN8 or AN10 supply fitting. These power steering pumps have a pressure relief valve. Mounting brackets available for head or block mounting. In this Tech Tip, John helps a customer troubleshoot his heavy steering in his project.